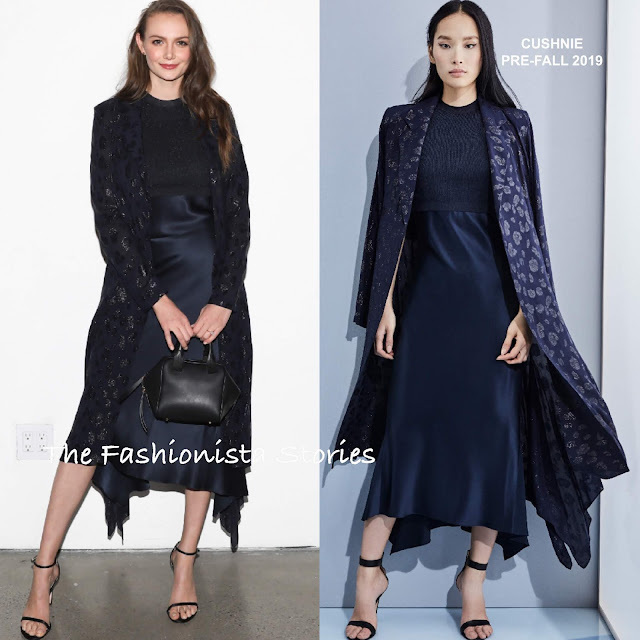 Yesterday(February 8th) the Cushnie F/W 2019 runway show took place at Spring Studios Gallery 1 in New York. CEO, Creative Director and Co-Founder, Carly Cushnie celebrated a new era of dressing modern women following the newly re-branding of the fashion house. 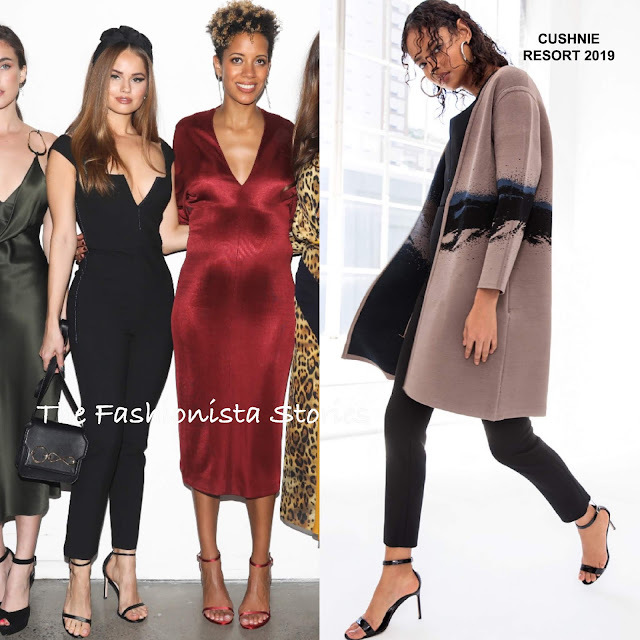 Of course she had some celeb guest front row, who were all wearing CUSHNIE of course and you can check out the collection HERE. Angela Sarafyan, who also attended Kate Spade's show, wore a PRE-FALL 2019 ensemble. 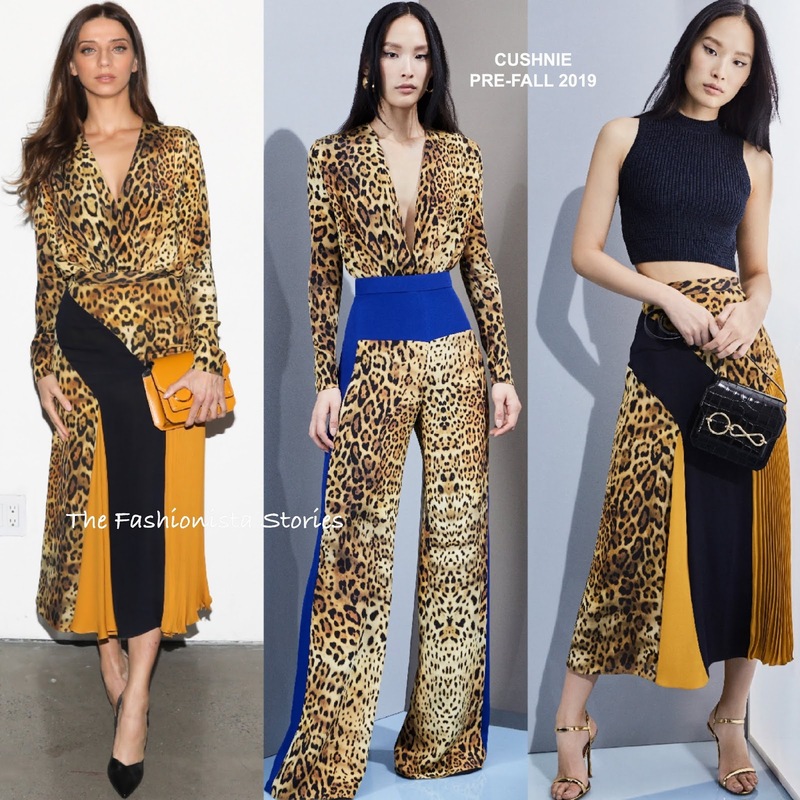 Her look featured a long sleeve tan leopard, deep V bodysuit with the tan leopard, navy and antique gold double Georgette high-waisted midi skirt with asymmetrical pleats, and the antique gold twist ring crossbody. Debby Ryan posed with Carly Cushnie, who looked beautiful in a red silk dress. Debby was probably my favorite her as she served up a chic, sultry look, wearing a RESORT 2019 black jumpsuit. Her jumpsuit was a accessorized with the black twist ring crossbody and black STUART WIETZMAN sandals. Rainey Qualley wore the RESORT 2019 'Emilia' dark olive double charmeuse sleeveless pencil dress with a front cowl neck and hardware detail. She also carried the Pre-Fall 2019 twist ring crossbody bag in tan leopard calf hair. The sandals are too heavy with this sultry dress but she looks great otherwise. Model Kate Bock wore a SPRING 2019 ensemble which featured a white multi mock neck knit top with layered fringe cuffs and pink sand high-waisted flare liquid cady and stretch charmeuse pants. She carried the Spring Summer 2019 mini 'Whistler' pink sand nappa bag. Andi Matichak wore a PRE-FALL 2019 navy double charmeuse, flare slip dress with a lurex knit top with the navy sheer trench with cascades at the sides, and a waist tie. She carried the carried the Spring 2019 mini 'Whistler' black nappa bag which topped off her look along with ankle strap sandals.